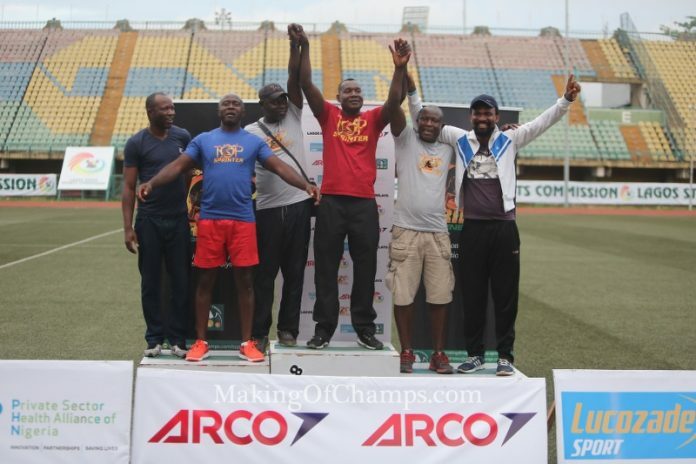 Rivalries of yesteryears were re-ignited on the track of the Teslim Balogun Stadium in Lagos on the third and final day of Top Sprinter Lagos Relays 2016, as former National and Continental Champions squared off in a battle for supremacy on Saturday. 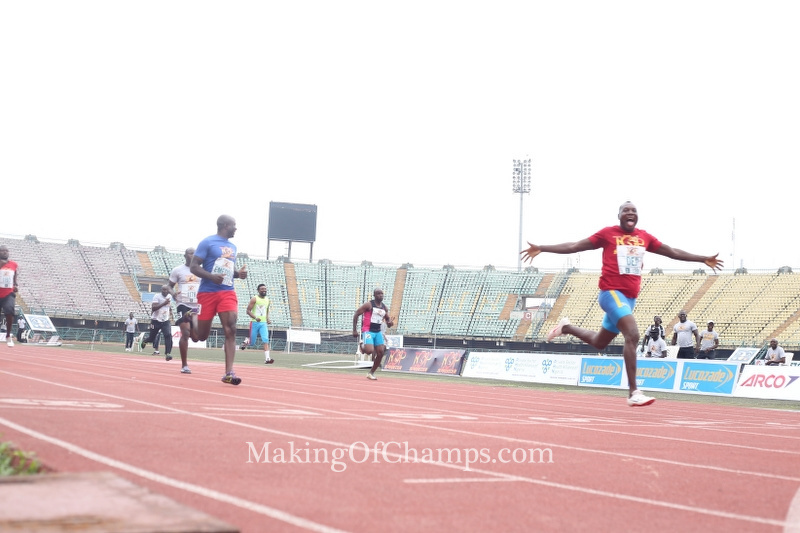 The men’s 100m Masters race was expected to be one of major highlights of Day 3 of competition, and it was one event no one wanted to miss, seeing that two Olympic medallists, Deji Aliu and Uchenna Emedolu were to go head-to-head. Incidentally, both men are ranked 5th and 6th respectively on Nigeria’s 100m all-time list, and belong to the elite class of male sprinters that have run inside 10s, having clocked 9.95 and 9.97s in the final of the 100m at the 2003 All-African Games in Abuja, winning GOLD and Silver respectively. 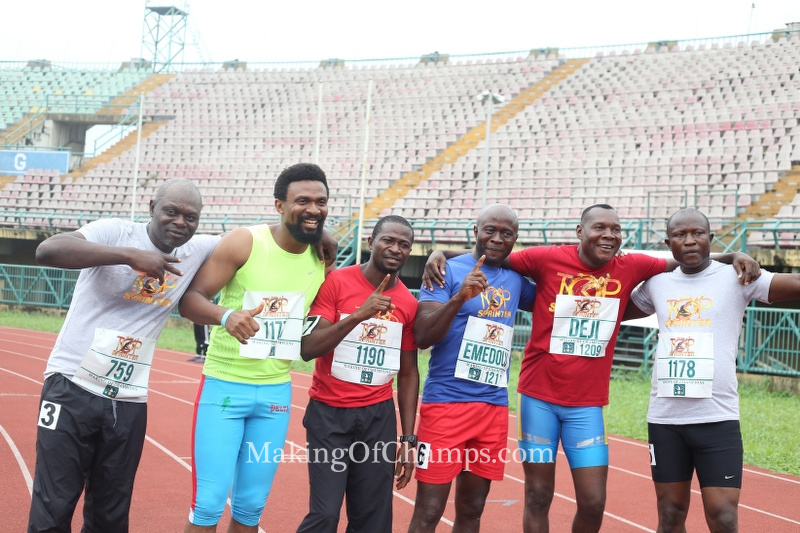 Old rivalries were re-ignited in the 100m Masters race on Saturday. Both Aliu and Emedolu also serve as Making of Champions’ Head Coaches in Lagos and Enugu, and are keen on raising the next generation of sprinters that would surpass their accomplishments. It was therefore a close call as the race was expected to go either way. Nevertheless former 100m World Junior Champion Aliu took control of the race with more than 50m to go, his height also providing the much needed advantage to take the win in 11.58s amidst cheers from the athletes who were delighted to be witnesses of the rare spectacle that unfolded before them. 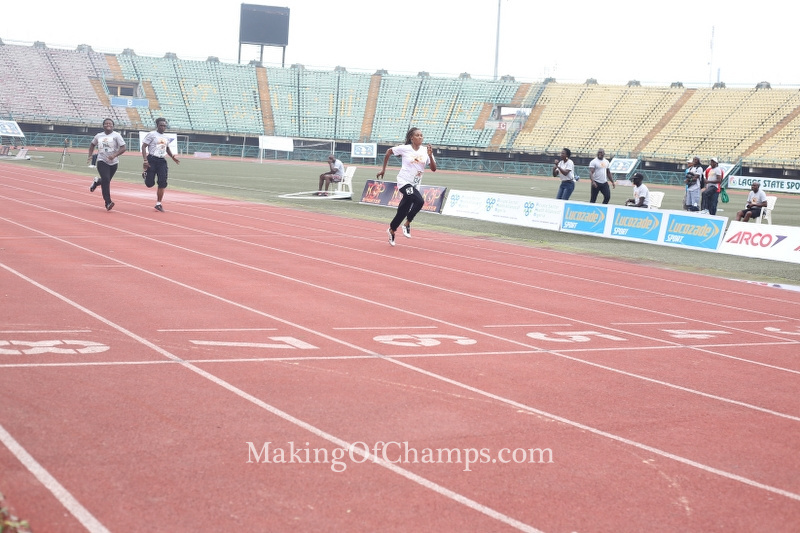 Deji Aliu won the battle for supremacy in the men’s 100m Masters race. Emedolu, also a GOLD medallist (200m) at the 2003 All-African Games, and IAAF World Cup winner, coasted home in 2nd place in a time of 12.04s, while former jumper Tunde Sulaimon placed 3rd in 12.67s. Athletics coaches Dennis Joseph (12.83s) and Ganiyu Adenuga (12.96s) crossed the finishing line in 4th and 5th positions, while Ayopo Oluyemi placed 6th in 13.48s. Aiyegbeni Christian (13.92s) and Buka Tigers Head Coach Ayo Solaja (13.94s) complete the list of competitors. Former All-African Games Champion Tina Iheagwam dominated the women’s 100m. Meanwhile the women’s 100m race also threw up some excitement as former World Junior Champion in the 100m and All-African Games GOLD medallist, Tina Iheagwam demonstrated that she still had it in her. She totally outclassed the rest of the field, clocking 16.92s to cross the finishing line 1st. She was followed by Secretary of the Lagos State Athletics Association (LSAA), Ijeoma Soribe who returned a time of 17.68s. Wunmi Emmanuel was 3rd in 18.06s and Abiola Williams Adu 4th in 18.21s. 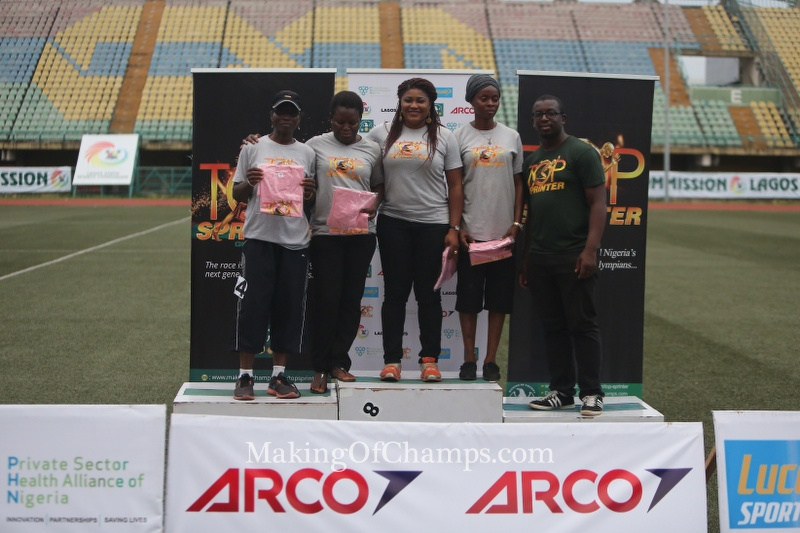 Competitors in the women’s Masters race receive their prizes from MoC Founder, Bambo Akani. My name is Anthony Ikechukwu Okeoma. A former content development executive with Harpostrophe media ltd. A graduate of mass communication, Auchi Polytechnic. A lover of athletics and football. I will love to write for makingofchampions. Advise me accordingly. Thanks.